Saturday Social Issue 42 – Facebook Hashtags, Office 365 iPhone.. The biggest social news of the week has to be the introduction of hashtags by Facebook this week. Whilst many have sneered that it’s just Zuckerberg’s company jumping on Twitter’s success bandwagon, there’s no doubt that it will be useful to marketers. The use of hashtags means that people can easily search for trending topics which are being discussed on the site. For example, last week saw epic hit show Game of Thrones receive more than 1.5m mentions on the social network in the wake of the ‘Red Wedding’ episode. Hashtags will be clickable and will be searchable from the search bar, offering marketers the opportunity to further control the audience for each post. “We’ll continue to roll out more features in the coming weeks and months, including trending hashtags and deeper insights, that help people discover more of the world’s conversations,” Facebook said, so watch this space. Yahoo has filed a new patent which details how charges for advertisements could be based on the viewer’s social influence. An influencer is someone who publishes highly useful content and is seen to be a trusted and authoritative voice within their industry. This would allow advertisers to further control who sees their ads, targeting users that are likely to have influence, using a scoring system that’s dependant on how many times a user is mentioned on social media. Whilst the patent was filed in late 2011, it has only just come to light as it’s only just been published. “The level of social influence may be based upon factors such as the number of followers of the user, the number of contacts of the user, and/or the title of the user,” it says. It also suggests that influencer scores can be further improved or used by considering factors such as the number of posts people make, the products they like, subscriptions, the influence and number of their followers and the amount of times their name gets mentioned. According to a report from the BBC, opinions are currently divided, with the marketing industry saying it could be widely adopted and a powerful tool, whilst privacy watchdogs are questioning how much consumers should be targeted. “We are not customers, we are a product to be monitored, packaged up and sold on to the highest bidder,” said Nick Pickles, director of Big Brother Watch. Easy to see why this could be a thorny subject in the wake of the NSA leak eh. Microsoft has announced that iPhone users can now access the Office 365 suite via their mobile with a new app, free for existing 365 users. The app needs a 58MB download, but this includes offline editing and creation for Word, Excel and PowerPoint files, which will have to be saved to SkyDrive or Sharepoint. Whilst the app is currently rolling out in the US only, it shouldn’t be long before UK users get it, meaning that it will be easier to access and edit Office docs on the go. However, only users of iOS 6.1 or later will be able to use the app, so it’s not suitable for earlier iPhone models. It’s optimised for use with a phone, so as yet iPad users can’t really use it, it’s not known if Microsoft will be introducing an Android version, or one for the iPad, although it’s thought it will be available for Surface (unsurprisingly). For more information and a guide to using the software, visit the official Office blog. Unless you’ve not watched any form of media and not connected to social recently, you surely can’t have failed to miss the buzz surrounding TV show Game of Thrones. GOT is a medieval fest of violent war, kings, peasants and politics with an enormous and impressive cast, a huge set and some quality acting, supported by Martin’s brilliant writing. It seems that many people who have read the books, set up cameras in order to catch loved one’s reactions to the much talked about ‘Red Wedding’. Without giving anything away, the scene is bloody and completely unexpected, so the shock with many people was completely genuine. Having read the books, I can say I was shocked by the written version and equally so with the televised episode. 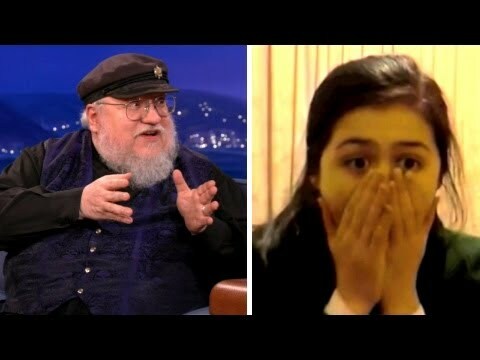 This week’s video shows the author of GOT getting to see exactly how people are reacting to his prose.